With her third win yesterday, Suzanne has made it onto our ToC Tracker! See where she stands here! 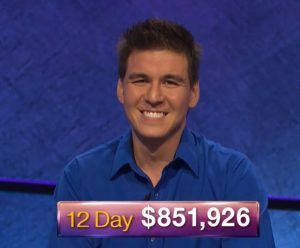 If you’re Canadian and cheering for Steve (or if you’ve cord-cut and are looking for a spot to watch him, it might make you happy to know that Jeopardy! streams online in Canada! You can watch it online at 7:30 (Ontario feed) or 9:30 PM Eastern (Alberta feed)! 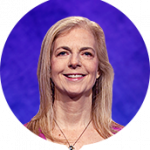 Correct response: Who is Harriet Beecher Stowe? You can find the Stowe obituary at the New York Times Archive. The quote in the clue refers to her most famous work, “Uncle Tom’s Cabin”; the work is generally seen to have fueled the abolitionist cause in the 1850s, and an apocryphal story recounts that Lincoln once told Stowe, on meeting her in 1862, “So this is the little lady who started this great war”. The book’s overarching theme is the evil of slavery; thus, on its publication, defenders of slavery raised significant protest. The protests were so loud that Stowe published “A Key to Uncle Tom’s Cabin” a few years later, providing documentation for the stories spoken of in the original work. Dozens of anti-“Tom” works were also published by Southerners. 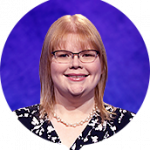 9 Comments on "Today’s Final Jeopardy – July 5, 2018"
I’d have gone with Mary Shelley, but I find out now that her death was a good 45 years earlier. Nice get by Marilyn on this one. Two flaws there. One is a “soft” flaw – Mary Shelley was a correct response earlier in the game, meaning she almost certainly wouldn’t be the response in Final. 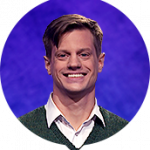 The second is a “hard” flaw – the category was “American Authors,” which rules out Shelley entirely. Very unfortunate episode. 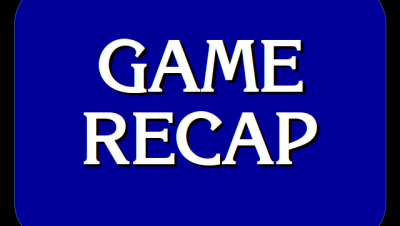 3 wrong answers on the daily double resulted a shutout. Let’s hope tomorrow’s episode will be better. As was pointed out, Shelley was not American. I wonder, though, if the earlier clue was stuck in specifically to make sure nobody went that route. What did Alex mean when he said something about being good at math would help with the answer to Final J.? All we got was her 1896 obit. I have no idea. My best guess is that someone who died in 1896 would have written most of their stuff around the time of the Civil War, but Alex sometimes does things that defy explanation. 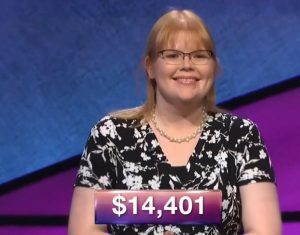 In your “informaton to Fianl Jeopardy” section, you wrote that the book “is generally seen to have fueled the abolitionist cause in the 1950s.” But shouldn’t that be 1850s!?! It appears Steve might have misread the clue as 1996…it is at least feasible that Agatha Christie could have lived to that year, she would have been 106.